a bit silly | Kris + Books = Good. *Sometimes*. Erin McKenzie, a newly promoted homicide detective, lands the assignment of her career when she is chosen to investigate Elizabeth Adams, the number one suspect in a slew of serial murders. Adams, elusive and devastatingly beautiful, is not only an accomplished seductress but also a lesbian. Erin, straight and married, needs a crash course in more than just undercover detecting. With Patricia Henderson, a fellow homicide cop and Adam’s former lover as a mentor, Erin embarks on the journey of her life… with love and danger hot on her heels. Former homicide detective Erin McKenzie couldn’t be any happier with her new life and her fiancée Elizabeth Adams—until the not so distant past comes knocking at the door. 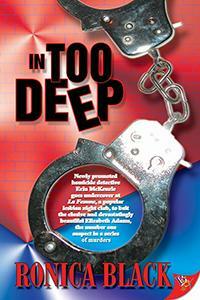 Erin’s former colleague Detective Patricia Henderson—a woman both she and Liz have intimate ties to—shows up with a fresh crime scene photo that looks all too familiar. The victim is an actor who works for Liz’s movie production company, and Liz had argued with the young man on more than one occasion. Erin can’t believe it’s happening again. The new murder resurrects old questions, and when Liz all but sends her packing, Erin can’t help but wonder what her lover is hiding. Lost, alone, and frightened, Erin is once again caught in midst of it all, and no matter how hard she fights it, she’s where she never thought she’d be… deeper. I realise some, if interested in the first book, might be enticed to buy the sequel if they appear together in the catalogue, but doesn’t somebody (ie publisher and/or bookstore) realise that they gave away the outcome of the first novel via the blurb of the second? Question for you: would you still buy this book now that you know what happened?? This entry was posted in blurbs, randomness, WTF. Bookmark the permalink. I probably would because in all these books its not like its a surprise that the two protagonists get down with it. I’ve never been shocked like “Wow, I didn’t seem him running away with the grocery store clerking after spending 120 pages screwing the Dr.” LOL So I likely would although the part about leaving the force might have given that away. But I’m easy. True, Tam, but some could have hoped for a Basic Instinct type storyline – with the heroine dying in the end with the knowledge that her love interest WAS the killer. MWAHAHAHA!I think I would be more inclined to skip the first and go straight to the second if I was to buy into this series. Reading the first after having read the second’s blurb would be too much like reading the last page of a book… which granted I’ve been known to do, but you get my point. Not the best piece of marketing I’ve seen, that’s for sure.I wouldn’t buy either of the books because they are f/f and I’m not particularly keen on that genre. Jen, twas a bit strange.You know I don’t think I’ve read straight f/f. Can’t really say it appeals to me either, but maybe I should check it out. The fact that Erin is straight and married but yes a lesbian and engaged in the second book would have been a turn off for me. I hate seeing marriages ruined. I totally understand where you are coming from. I was reading a post somewhere about reader no-nos and one of the ones mentioned was infidelity. This is a major no-no for me. I HATE reading about it and when I come across it in a book I usually put it down and walk away.